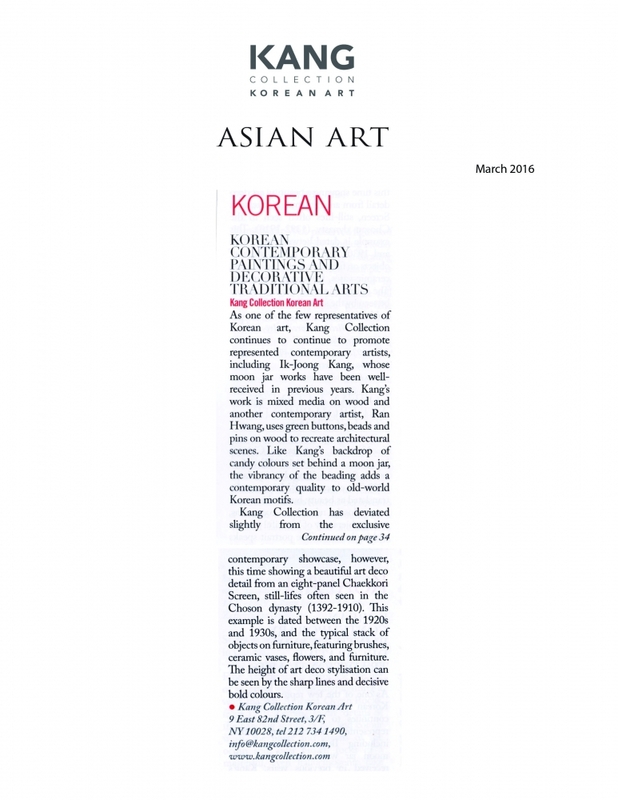 As one of the few representatives of Korean art, Kang collection continues to continue to promote represented contemporary artists, including Ik-Joong Kang, whose moon jar works have been well-received in previous years. Kang's works is mixed media on wood and another contemporary artists, Ran Hwang, uses green buttons, beads and pins on wood to recreate architectural screens. Like Kang's backdrop of candy coolers set behind a moon jar, the vibrancy of the beading adds a contemporary quality to old-world Korean motifs. Kang Collection has deviated slightly from the exclusive contemporary showcase, however, this time showing a beautiful art deco detail from an eight-panel Chaekkori Screen, still-lives often seen in the Chosen dynasty (1392-1910). This example is dated between the 1920s and 1930s, and the typical stack of objects on furniture, featuring brushes, ceramic vases flowers, and furniture. The height of art deco stylization can be seen by the sharp lines and decisive bold colors.